The currency of imports can be different from the funding currency, which enables importers to take a favourable view of a particular currency. Importer’s bank issues SBLC in the given format under SWIFTmessage format MT760. RBI has issued directions under Sec 10(4) and Sec 11(1) of the Foreign Exchange Management Act, 1999, stating that authorised dealers may approve proposals received (in Form ECB) for short-term credit for financing — by way of either suppliers’ credit or buyers’ credit — of import of goods into India, based on uniform criteria. Suppliers Credit: Supplier of goods located outside India. For non capital goods : upto 1 year or operating cycle which ever is less. For shipyards / shipbuilders: for import of non-capital goods : up to 3 years. SEZ, FTWZ, DTA units can avail trade credit. Please let me know, what is logic behind issuance of buyer’s credit limit as a sub limit to the LC( against import of raw material against LC). And can we take the buyers credit from the any other bank except the LC opening bank. 1. All banks have been classifying buyers credit limits differently. Technically, Buyers Credit is a structure which is used by issuing letter of undertaking (LOU) or letter of comfort (LOC). LOU / LOC forms a part of Non Fund Based Limit and is a type of financial guarantee. Banks has been classifying them under sub limits of Letter of Credit (LC), Bank Guarantee (BG) and some banks are creating specific limits in the name of Buyers Credit under Non Funds based limit. So long it is part of non funds limits, it does not matter under what head they are creating sub limit excepts for those whose requirements are for LC and Buyers Credit. As this would result into limits being exhausted for either of the purpose at a given point in time. Based on case to case the same can be taken up with importer bank to change the structure of limits. 2. Answering your second question, Yes, buyers credit can be taken from any bank including LC opening bank overseas branches. But few banks are insisting on taking buyers credit from their own overseas branches or they are creating differential pricing for LOU. Reason being, as per Basell III, capital requirement in case of LOU is going up where as in case of LOC it is not. LOC is issued in case of parent subsidiary relationship. it was very helpful…can u shed light on other forms of financing import and export also if Lou facility is appearing in balance sheet then ?? we have opened an import L C which is due for payment on 27/12/2012.Now the importer hasrequested us to convert the LC as buyer’s credit payable after 180 days as the rate for realisation of LC is costly.Pl clarify whether the importer’s request is correct. Many times importer misunderstand the RBI Master Circular on External Commercial Borrowing and Trade Credit, which say AD can approve trade for import of non capital goods upto 360 days from date of shipment. This does not mean it is blanked approval for all buyers credit transaction for upto 360 days. For any tenure to be approved as Buyers Credit it depends on the working capital cycle of the customer ( Importer) which is ascertained by bank at the time of sanctioning of limits. So if the sanction limits say tenure of 180 days from the day of shipment, per say it cannot be allowed beyond that tenure. Only exception to this is if the branch is convinced about a particular case, it can go back to credit manager / approving authority for extension of tenure beyond 180 days with justification. If approved, the same can be converted to buyers credit for further approved tenure. Again specific to this case, LC was due on 27/12/2012 and the question was asked on 04/01/2013 which means already there is delay of 8 days on the payment. Banks should go ahead and make the payment immediately. Reason: LC transaction is a guarantee from bank that it would make payment on due date and if the same is not done, it spoils the reputation of bank in international market. 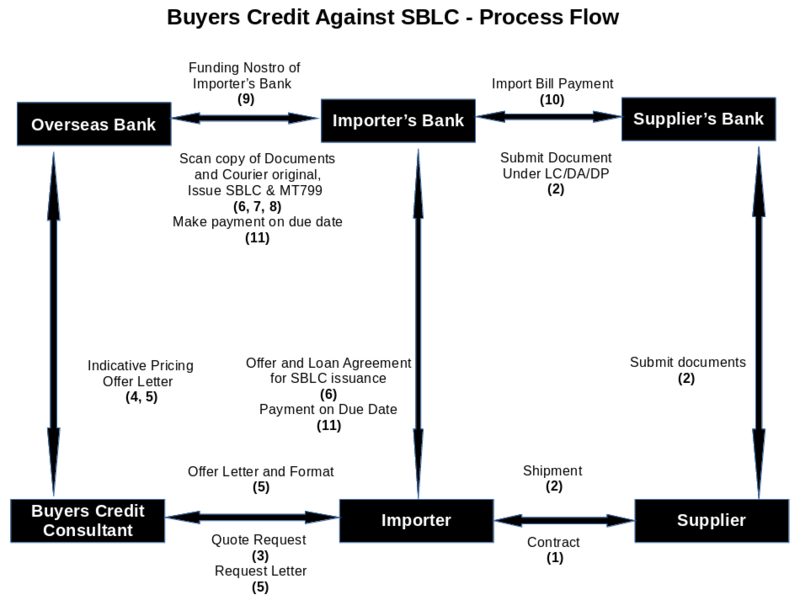 Thank you for the very comprehensive writeup with clear process flow on Buyer’s Credit. Could you please do the same for Supplier’s Credit? In case you have already done that, could you please send me the link? Please find below RBI Circular Extract, which clearly says, for all imports permissible under current Foreign Trade Policy, bank can provide buyers credit subject to other criteria are fulfilled. why would an importer go for a buyer’s credit? and what benefits would he get? Question is already answered in the above article. Major factor for importer going for buyers credit is interest cost saving. What payment mode should importer’s bank use at the time of making repayment of buyers credit transaction principal and interest ? Reimbursement claim or Direct credit to nostro of buyers credit bank. Importer’s Bank should follow the repayment process as instructed to them buyers credit bank in their MT799 sent at the time of disbursement of buyers credit. As a market practice, method of direct credit to Nostro of buyers credit bank is used. Reason is more of procedural. Liability of importers bank is till the funds come to nostro of buyers credit bank and incase of delay, buyers credit bank tend to claim delay payment interest. Where are incase of reimbursement claim, liability of claiming funds from Importers Bank’s Nosto falls on buyers credit bank on due date. 1. Can LC be established in foreign currency? 2. Can buyers credit take place against the said LC? Please advice & refer any book which may enhance my knowledge in this case. For Buyers Credit facility which external rating (short term or long term) rating is to be filled in letter of undertaking format as required by few banks? External Credit Rating in LOU is SBI and few other bank specific criteria and not the industry practice.As per current process being followed: for raw material import short term rating is used and for capital goods import long term rating is been used. How bank should calculate the drawing power if customer uses Buyers Credit ? Drawing Power is the amount of Working Capital funds the borrower is allowed to draw from the Working Capital limit sanctioned to him. Because the working capital limit is usually allotted to a borrower against security of Stock and Book Debts, the amount of funds a borrower is allowed to draw is calculated by considering the total value of Stock or Inventory plus total value of Book Debts (Debtors) less Creditors for the month after deducting the margin. In cases where customer has taken Buyers Credit, equivalent amount of the buyers credit availed needs to reduced from the total drawing power, as the amount of stock / book debt has already been funded by bank. Thanks Sanjay for your immediate reply. Let me explain my case again in detail with figures. The Bank has sanctioned us interchangable facility for full amount (FLC+BC+CC) to the tune of Rs 11.00 Crs. We have utilised FLC for Rs 10.00 Crs and availed Buyers Credit facility at the time of maturity of FLC. Presently we are enjoying Rs 0.50 Crs as Cash Credit limit. The stock (Rs 6.50 Crs) & Debtros (Rs 8.00 Crs ) which are presently has been funded from Margin and BC. Now, my question is why we should not calculate the DP considering BC as good as CC facility since either way it will be funded from Bank Fund facility, being BC as fund based facility and present current assets are not funded from Cash credit facility. Moreover, your site is very helpful to us to update ourselves with the latest changes. thanks a lot for sharing such a beautiful article and finest replies ….I want to clarify my understanding on the issue that correctly stocks came through Buyers credit facility are added while calculating Drawing Power , but whether Drawing Power means both Fund based and Non-fund based !!! because CC is under fund based facility and BC is under non-fund based facility…so what is the logic behind deducting Buyers Credit amount…. I am importing computer hardware in india. I am importing the material against 100% advance payment. Can you arrange the buyer’s credit against performa invoice? Buyers Credit can be availed in any freely convertible currency. But one also needs to check whether said currency will be available with Buyers Credit providing bank. If not then it is not possible. To specifically answer on AED (United Arab Emirates Dirham), yes, buyers credit can be taken in AED and there are also banks which provides funding in AED. Can you tell me the different of calculation of DP while considering unpaid stocks and bank borrowing if possible please show with an example??? In Many banks; the threshold limit is USD 100,000 above.. for which they give the low quotes. If our Import Invoice Amt. is less than USD 100,000 & than also we require the low quotes as applicable to Above 100,000 USD; than what is the via media to solve the issue.. Either you can club multiple invoice to a single buyers credit quote and single funding or touch base with more overseas bank. Both of this option will help to reach near lowest quote if not the lowest quote. Note: Not all bank allow clubbing of invoice & some allow clubbing of invoice from same supplier. As per RBI perspective there is no such restriction. Above rules are as per bank’s internal policies. If the below clause would be there in LOU, then how the interest amount should be calculated? Please note that the respective drawdowns will be on a six monthly LIBOR reset, where LIBOR will be reset after every six months, and the interest for each six months will be payable on the value date of such reset. Principal and Interest for the final six months will be payable on maturity. Above clause comes into play only when buyers credit has been taken with a reset of LIBOR every 6 months but margin over LIBOR remains constant. Thus, in the given case, at every reset interest has to be calculated. Importer will pay interest on completion of sixth month and Buyers Credit Bank will send a swift message with revised interest amount (LIBOR+Margin) and next date on which interest payment has to be made. As per few banker there was a letter from RBI which was sent to banks around Oct 2011 in which banks were asked to ensure that borrowers be disallowed from borrowing more than their fund-based limits. There was an article in Economic Times talking in relation to same (Click here to read the Article). Because of the said letter importers have been facing the issue mentioned by you. As per my understanding there has been no change in relation to earlier stand of RBI and there is no circular which clearly specifies the same. Only way out is to ask your banker to provide copy of the RBI circular with the above clarification or copy of RBI letter which specify the same. Sir,as per latest RBI circular on import of Gold restrictions are not applicable for exporters hence pl clarify whether we can export gold medallions as gold jewellery. We want to import capital goods from Germany for Euro 43500.00.. Please inform us it is beneficial for going for a buyers credit if our company is debt free company i.e we are holding funds in our fixed deposits and we want to avail buyers credit.. is it beneficial.. In the current market scenario where Forward premium are in range of 5% pa, it is not profitable to take buyers credit by way of keeping 100% FD. Why one should go for Buyers Credit, If he can import material under Foreign Letter of Credit ?How BC is more beneficial than FLC ? 2. Even if a supplier is ready to provide a usance period, the period might be lesser than required by you. As per RBI provision, banks are authorised to approve buyers credit upto 360 days from the date of shipment. 3. FLC charges starts from the day of LC opening. LOU charges starts from time of taking buyers credit (after documents reach bank’s counter). Thus resulting to saving in bank charges. If the goods procured, falls in capital goods catagory then we can enjoy the buyers credit facility for 3 years from the date of BL. This is a standard rule or it may change as per the sanctions from the banks. If sanction letter is silent about the above rule then can we take buyers credit for 3 years. Can we have any RBI circular on that. We were using the Buyers Credit facility and paying the interest to the bank but now we have made an arrangement with the supplier and arranged for the extended credit from the supplier. In other words now the interest we were paying for the BC will be paid to supplier. What are the procedures for the same? Below two articles will provide you basic details about the concept. Below article talks about taking suppliers credit from banker but in your case it has to be replaced with supplier. Thanks a lot Sanjay for such a prompt response. Can you please help me with the documents to be executed or required before entering in to such transaction and subsequently at the time of payment of interest and principal amount. Further is there any limit on the period of trade credit without any interest. And further can we delay the payment beyond 360 days from shipment date in any circumstances. 1. Incase of any prepayment : interest allowable will be only for used tenure. b. if Sinosure accepts to insure then which type of documents or asset will be required by Sinosure. Sir we have imported a machine for the value of USD 400000 and for which we have taken buyers credit when USD INR was at 55.50. But as USD INR has gone up to 69, What would be the impact of this and what will happen if i am not able to maintain the mtm. As the term loan is approved in INR and Buyers Credit (BC) being foreign currency (FCY) funding, it will have impact on the Mark to Market (MTM) requirement. You will have double impact…. B. You will also have to bring MTM on bank share. As bank share is locked in INR and with movement of dollar there is shortfall. A. Book Forward / Call options for the transaction to avoid future MTM. B. Approach bank to increase the term loan amount. C. At time of rollover of buyers credit transaction, convert part / full amount to term loan and rest is to be rolled over. can we extend period of buyers credit which is due. shall required RBI prior or after permission for that. Below two article would answer all your queries. As a summary in case of raw material rollover is possible where such transactions does not exceed operating cycle of the importer. What are the RBI guidelines for availing Letter of credit facility and/or buyers credit facility for the import of second hand capital goods? Is it possible for a company to avail these facility for second hand machinery. RBI Master Circular Circular on Import of Goods and Services & External Commercial Borrowing and Trade Credit are silent on the above subject. Reference is found in Exchange Control Manual in relation to second hand machinery, extract of the same is given below. B. Import of the given category of second hand machinery is allowed as current Foreign Trade Policy. 1. Rules of ECB are applicable on Trade Credit (Buyers Credit / Suppliers Credit) only if their tenure is more than 3 years. 2. Same Circular under section of Trade Credit for Imports into India part c gives rights to banks to issue LOU/LOC/LC. RBI Circular Extract: AD banks are permitted to issue Letters of Credit/guarantees/Letter of Undertaking (LoU) /Letter of Comfort (LoC) in favour of overseas supplier, bank and financial institution, up to USD 20 million per transaction for a period up to one year for import of all non-capital goods permissible under Foreign Trade Policy (except gold, palladium, platinum, Rodium, silver etc.) and up to three years for import of capital goods, subject to prudential guidelines issued by Reserve Bank from time to time. The period of such Letters of credit / guarantees / LoU / LoC has to be co-terminus with the period of credit, reckoned from the date of shipment. If an Indian company avails certain type of services from a foreign parent company on credit will that fall under the purview of Trade Credit as per External Commercial Borrowing? It is a difficult question to answer. Below are few points which can provide some clarity. There are in all 161 services which are under GATS. Check if service provided by your parent company falls under any of the same. 4. In ECB and Trade Credit circular highlights point “from the date of shipment” meaning ment for import of physical goods. If that is correct than trade credit is not allowed in import of services. 5. At last, as a market practise, buyers credit (a form of Trade Credit) is not been done for import of services. If i need to take buyers credit, can i ask the bank directly or i need to take some approval from RBI. First one needs to understand whether it is raw material or capital goods import. Given below are links to articles which will give you complete details about what you will have to check with your bank first for both case. Secondly, RBI has given rights to approve buyers credit to bank subject to below conditions are fulfilled. C. All-in-cost ceiling : Maximum interest which can be charged by overseas bank is 6 Month Libor + 350 bps. I am under impression that that BC can be taken maximum 180 days from Bill of lading date (BL date), but can we take roll over BC again, means beyond 180 days. if we can what are the formalities to be done. A. As per RBI maximum tenure which banks can approve buyers credit in case of non capital goods (Raw Material, Consumables, Accessories, Spares, Components, Parts etc) import is 360 days from date of shipment. C. Banks where importer is having limits, sanctioned tenure. Based on the answers to the above question, importer can or will be allowed by bank to rollover the transaction beyond 180 days or also take buyers credit for 180 days. 2. Extended period means period between 3 to 5 years. What is the difference between LOU and LOC? Major difference between Letter of Undertaking (LOU) & Letter of Comfort (LOC) is their legal enforceability. Not getting into technicality of it, from buyers credit perspective, Indian Bank provides LOU to other banks and provides LOC to own overseas branches. For Example: If buyers credit is taken by a SBI Client from SBI Tokyo. SBI India can provide Letter of Comfort, Where as if the funding are arranged from say Bank of India Singapore, they will have to provide LOU. Reason: For every guarantee a bank issues, bank have to set aside funds as per capital adequacy requirement. Provisioning requirement is low in case of LOC as it is inter branch transaction in comparison to LOU. Thus incase of inter branch transaction LOC is used instead of LOU. What is RMA arrangement and what is the use of it? How can a bank make RMA arrangement with other foreign bank? Can RMA be established by a Bank only or even any of its branch can also establish it separately with other bank? RMA is established bank wise and not each branch wise. Since Foreign Trade Policy allows imports in INR also. What are the regulations related to buyer’s credit in respect of an import invoice which is in INR ? We have opened two separate Import LC’s : one for technical consultancy services and the other for Shipment of Capital goods . Can we have both the LC’s converted into Buyers credit ? Could you Please Clarify and the process involved for documentation. Part 1: Only LC related to import of capital good can be converted to buyers credit. Buyers Credit is not allowed on import of services. Part 2: Article Buyers Credit on Capital Goods answers your second part of the question. We are a Offshore Logistic/ shipping Pvt Ltd company, Purchasing a Platform Support Vessel to Charter ONGC, Work order in Hand, We Aproached to Bank of India for Term Loan of Rs.__ Amount. BOI alone not agreed for entire, they suggested go into consortium with another two bank i.e, PNB & BOB, Now all the Bank Sanctioned Term Loan in INR with provision to convert in FCL, the interest rate in INR is 13.75% and in FCL is about 6%, Bank is agreeing to disburse in FC but we like to take LOU to obtain Buyers credit facility. Kindly suggest is it workable? Process time and interest rate? Your early reply will be highly appreciable. We take BC on import of goods for 90 days. We have also CC facility from our bank. Now we have sufficient fund to repayment of BC. Can we pay back for used BC before due date? Yes buyers credit can be prepaid, depending upon which banks funds are arranged from. Some accepts prepayment with complete tenure interest and some ask for additional charges. Below article will provide complete information on prepayment. When buyer’s credit is paid back then which LIBOR will be applicable. Libor at the issuance of buyer credit or at the payment of it. At the time of disbursal, Buyers Credit providing bank will send a swift message (MT799) informing LOU issuing bank about the due date as well as interest amount calculated using Libor on the date of taking buyers credit. We have imported raw material on open credit. Is there any provision wherein payment can be extended beyond 360 days. And if yes what is the procedure and what is the maximum time remittances can be done. Yes it can be extended subject to below provisions been satisfied. Please find below relevant extract from RBI Master Circular for Import of Goods and Services. (ii) AD Category – I banks may permit settlement of import dues delayed due to disputes, financial difficulties, etc. Interest in respect of delayed payments, usance bills or overdue interest for a period of less than three years from the date of shipment may be permitted in terms of the directions in para C.2 of Part III below. (i) AD – Category – I bank may allow payment of interest on usance bills or overdue interest for a period of less than three years from the date of shipment at the rate prescribed for trade credit from time to time. (ii) In case of pre-payment of usance import bills, remittances may be made only after reducing the proportionate interest for the unexpired portion of usance at the rate at which interest has been claimed or LIBOR of the currency in which the goods have been invoiced, whichever is applicable. Where interest is not separately claimed or expressly indicated, remittances may beallowed after deducting the proportionate interest for the unexpired portion of usance at the prevailing LIBOR of the currency of invoice. what all documents are required for buyers credit?? which. need to sign by the borrower???? X Ltd is involved in execution of a power project and has obtained a term loan facility from bank – rupee term loan . Buyers credit / LC limits are sublimits with in this term loan facility (term loan repayable over a period of 15 years from project commencement). Buyers credit in foreign currency has been taken for import of machinery to take advantage of interest arbitrage. Buyers credit is typically contracted for a period of 6 months after which it is rolled over,ultimately Buyers credit will be settled by debiting the term loan account. How should the buyers credit facility be classifed – short term (since it is contracted for a period of 6 months only) or long term. Whereas Buyers Credit Suppliers Credit and Unpaid LC taken for less than 1 year shall be disclosed under the sub-head ‘Short Term Borrowings’ under the Head of ‘Current Liabilities’ under Equity and Liabilities. Sir, whether we are required to give TRC & No permenant establishment certificate for Form 15 CA/15 CB at time of remmittance against import of goods..
Also tell me when TRC & No permenant establishment certificate is mandatory in case of foreign remmittance..
Form 15CA & Form CB are only required in case where amount paid is taxable in India. Import payment is not taxable in India and thus not Form 15CA / CB are required. Please refer article Revised Forms (15CA, 15CB) and Rules for payment to Non Resident for further details. Sir i plan to import some machinery’s, now i need to open LC, the bankers said arrange the foreign bank then only we able to open a LC, but my foreign bank agent is saying now we count arrange the bank , went will Our BL Copy is receiving then only we arrange the bank ..! who is correct banker or agent ..??? now what will i do, please advice me ..!! one of our customers who is enjoying cash credit facility with us has come up with a request. Company Activity : Trader in Chemical. They are going to close the one crore Cash Credit account and they want a one crore buyers credit as a facility. just buyers credit. nothing else. 1) In our bank i have never heard anyone having a pure buyers credit facility.its unprecedented.all we do is sanction LC and on that buyers credit will be given with approval of appropriate authority. 2) If i am going to give, then is it possible to give it as facility. The company wants usance for 180 days . right now their LC usance assessment is 120 days.Right now they get a credit period of 6 months from the German supplier. Now they are planning to buy stock at sight so that they get a appreciable discount. 3) If at all we give them buyers credit, as a banker there is very little income to my branch. In what way can i justify giving them this facility ? 4) in what way can I classify it. Fund based or Non-fund based, will it be considered in the same lines of Foreign Bill Discounting (Non-LC) limit ? Sir, the company wants to take advantage of interest arbitrage. I do find their intention reasonable as it is totally a trading unit. Please advice on me this Sir. All i want to know is can i proceed with working on the proposal. and how this facility will be implemented in post-sanction point of view. 1. Yes, you can give pure buyers credit facility. But better way is to make it 100% interchangeable to CC limit. 2. Tenure of buyers credit will depend on Operating Cycle of importer. I am assuming that you have arrived at 120 days for LC usance based on Net Operating Cycle. Thus cannot be given for more than 120 days. 3. Only way to justify is that some income is better than no income. Also it keep option for future requirement of the client. 1) IF buyers credit is given under CC, then the period of buyers credit will be that of the operating cycle ? 2) is operating cycle and LC usance are connected or not. as i am new to pre-sanction. i could not understand it. Are they one and the same or different ? 4) will this CC limit given in INR, should it market to market or something like that in connection with forex fluctuations. 2. They are different. Any tenure sanctioned for client will depend on Net Operating cycle. Once operating cycle is arrived at, buyers credit tenure, LC usance tenure etc. is sanctioned to client in his limits. 4. Limits has to be marked to Market. Whenever there is a difference, that would result into client bring in more margin money. The over all exposure from the Bank should be with Mpbf. The Fund based and non fund based limits should be within mpbf? As few Banks internal policy says it should be within mpbf and other provide non fund based limits above mpbf. what does RBI says on this? Can we transfer the trade credit to a newly incorporated entity/company, for an example if our company is shifting its assets and liabilities to a new entity, so can the existing trade credit can also be transferred to the new entity or not ?? and what would be the circumstances if the company is unable to pay off the sellers credit on time, as it is very clear that we cannot get extension of sellers credit. 1. Query: company is shifting its assets and liabilities to a new entity: My revert: I have not come across such case, thus my revert on this query is more of guess. You will have to take an NOC from existing banker for shifting of assets from company A to Company B. For limits under Trade Credit, company will either have to prepay the amount or wait till these buyers credit tenure are exhausted. This practise is followed by bank at of take over of limits. 2. Sellers Credit question is incomplete. Whether it is capital goods or raw material. Whether funds are provided by Overseas Bank or Supplier. We have LC/Buyers Credit limit with operating cycle of 90 days. We had taken LC for 120 days. Next month is the due. Can we take buyers credit on the LC which will get due and make the payments. According to RBI Circular No. RBI/2012-13/151 A. P. (DIR Series) Circular No. 12 , amount in the EEFC account should be converted into Rupees on or before the last day of the succeeding calendar month after adjusting for utilization of the balances for APPROVED PURPOSES or forward commitments. Is it possible to retain the amount for 3 years in the EEFC account for the purpose of paying back buyers credit, since it is an APPROVED PURPOSE?? (ii) permissible capital account transaction [in accordance to the Foreign Exchange Management (Permissible Capital Account Transactions) Regulations, 2000]. Buyers Credit for import of capital goods would fall under Permissible Capital Account Transaction. Again here there has been no time limit specified by RBI in FEMA Regulation. Given by what information is available, funds cannot be held for 3 years in EEFC for repayment of Buyers Credit. Further clarity can be provided by RBI on it. A company has sanctioned TL limit of 10.00 crores for import and purchase of textile machinery. advance payment of 10% of the cost of machinery which the company is agreeable to. The import documents for the 90% of the value of the machinery will be routed through the Bank of the company which has already sanctioned the TL as above. My query is whether the company can avail the Buyers Credit on or before due date after having accepted the documents earlier. This will obviate the need of opening an LC so as to save on LC opening charges though the Bank need to provide LOC/LOU by earmarking the TL to that extent. Also please advise whether the obtention of the ECGC Post shipment guarantee is mandatory to avail the EPC/EBN limit ? The query is raised particularly in case of a company who has sanctioned limit of 8 crs of CC/EPC/EBN limit and the entire sales is on account of export with more than 10 years in related line. The company has been using the limits as CC only as the bank is insisting on having post shipment ECGC policy for availing the same as EPC/EBN. I am sanctioned bank facility of 6.5 crore for CC / buyers credit.so if I am using buyer credit for 6 crore for tenure of 180 days. 1)on due date after 180 day bank will pay buyer credit amount to supplier bank from my CC account or I have to provide fund from my side? 2)if bank pay from my CC account then is regular interest will be charge from 181 days is 13%p.a? Before answering your question, one needs to be clear about two concepts. As per RBI guidelines, buyers credit is allowed upto operating cycle of importer. If your bank is allowing you to take buyers credit upto only 180 days, based on track record by this time your goods are sold and funds recovered from Debtor. B. Drawing Power: (Stock+Debtors) – (Creditor + Buyers Credit) – 25% margin. You will be able to use CC only if there is gap available in Drawing power. Sales turnover is already routed to CC. Thus if goods has got sold, funds will be in CC. Thus payment is made from CC. If drawing power is short, then you will have to bring in additional funds. What ever funds is utilized in CC, your regular rate will become applicable. Sir, a loss making PSU with letter of comfort from govt want to import capital goods from China. No company rating as of now. How to go for supplier credit ? What is the sequence of process ? You are correct in stating that practically buyers credit is not workable for tenure beyond 3 years because of above conditions. I am also aware that few trade association have raised this issue under different forums for amending the above rule, so that SME and Mid corporate can take benefit. As of now only under two cases it can be extended beyond 3 years. 2. Large Corporate: Banks are ready to fund them without LOU from Indian Bank beyond 3 years. I did come across one such transaction, but without LOU, buyers credit costing is higher because of which they did not use it. sir, is there any charges called RBI registration charges(deducted by banks) needs to pay in Buyers credit transaction.Also such charge is not deducted directly but a part of LC commitment charge.can you please guide us about the same. 1. There is nothing called RBI Registration Charges. Your are been misguided. 2. LC Commitment charges are not related to buyers credit. It is related to suppliers credit transaction, where at times bank structure the charges as commitment charges, interest charges etc. Again nothing to do with RBI. Sir.. the bank has sanctioned me Buyers credit facility of Rs.100 Lac and it is allowed within CC limit of Rs.200 Lacs. Suppose I take Buyers credit to make payment to my Raw Material supplier, the bank keep hold on equivalent INR to my CC account. My question is, If I am availing buyers credit from my sanctioned CC limit then why bank should charge LOU charges @ 2.26% p.a. 1. When your bank is blocking CC limit and sending LOU (under sub limit) against it, the will charge for only LOU charges at 2.26% pa instead of CC charges of 13 – 14 % pa.
2. Buyers Credit tenure is based on Operating Cycle of Importer. Assuming if your operating cycle is 180 days and you are getting 90 days LC from your supplier. For balance 90 days you can take buyers credit. 180 days is calculated from the date of shipment. Further details on it can be found in Relevance of Operating Cycle in Buyers Credit Transaction. 1. Do we need the LC for 3 years to avail Buyers Credit for 3 years? Buyer’s credit would be beneficial if interest rates in exporters country are less than India i.e importers country. Is there any information on the interest rates prevailing in all the countries so that we can compare the benefit from availing buyer’s credit. It is not necessary to arrange funds from exporters country for Buyers Credit. Buyers Credit can be arranged from any bank or Indian bank overseas branches which works out beneficial. If the procurement of material is from SEZ unit then………Can buyers credit take place against the said LC? Technically buyers credit can be taken against purchase from SEZ. As per SEZ Act, units in SEZ are not consider to be part of India. Thus any purchase from SEZ would result into import into India. For taking buyers credit, given transaction should in foreign currency. Is there any RBI instructions where it says Trade Credits are permitted for import from SEZ. Yes. both developer and units can avail buyers credit and suppliers credit for import of capital goods and raw material. Will you please provide us provision for the same. so that we can refer the provision regarding such transaction or refer us any book. Importer can approach his banker for UPAS LC. Discounting for the can be through bank arranged by Importer or Importers bank. When the bank sends us document arrival notice, what is the maximum tenure that we can use to submit documents to issuing bank ? How long can issuing bank take to make payment to benificiary bank ? 1. It will depend on the payment mode. If it is sight LC or usance LC, with in 5 working days importer or importer’s bank will have to confirm if document are compliant and make payment or raise a discrepancy. Incase of discrepancy, it depends on Importer, exporter and exporter’s bank, how they resolve the query and thus the amount of time. 2. Incase of DA / DP mode : Importer’s Bank will hold the document till time Importer do not give confirmation or payment. If there is delay, they will seek instructions from Exporter’s Bank. Buyers credit is charged at fixed rate (interest rate is fixed at the time of availing the Buyers credit ) or floating rate ? Buyers Credit is at Fixed Rate and rate is fixed from the date of disbursement. If we have arranged buyers credit loan in any indian bank then we will provide to bank 15CA and 15CB copy. Can I use buyer’s credit to fund even my initial security margin of LC? In other words, Can I not setup a fixed deposit for my LC security margin and fund that from my account instead request for a buyer’s credit? Considering a scenario where I have enough credit limit with the bank.. Above option is not allowed. Buyers Credit can be taken on goods imported under lc but it should be within operating cycle of your company. If companies operating cycle is 90 days and goods are imported under LC 90 days usance than buyers credit cannot be taken further. If companies operating cycle is 180 days and goods are imported under LC 90 days usance or sight LC, then buyers credit can be taken for further tenure. Query 2, In case of Buyers credit , does central Govt provide any subsidy for the exchange rate Fluctuation, ? if yes, then How many percentage ?? Query 3, Does govt provide any forward contract premier subsidy to the importer who convert the Term loan in Foreign currency Loan?? Query 4,what is the maximum days LOU / LOC for capital goods ?? Query 5, Can buyers credit roll over till 5 years in case of Capital Goods ? Query 6, in any case , is it possible to take the buyers credit after making the payment through Term loan to the final Beneficiary ( exporter ). Revert on each of the above query. 1. Incase you are able to get TUF benefit, then its beneficial to go for it instead of buyers credit. 2. Government does not provide any subsidy on exchange fluctuation for buyers credit. 4. Bank can provide LOC / LOU for maximum tenure of 3 years. 5. As per RBI guidelines, maximum tenure is 5 years but banks cannot provide lou above 3 years. Thus practically buyers credit is possible for 3 years. 6. Buyers credit cannot be taken after terms loan is disbursed and payment is made to supplier. sir, As per RBI notification, All the industries including infrastructure can avail buyers credit for the period of 5 years, then banks should follow the direction given by the RBI. Can buyers credit amount be directly paid to exporter instead of routing through his banker. 2. Local regulation in which these branches are based. Banks Offer Letter / LOU format have information about it. If silent, one needs to check with banker before moving ahead. If i took buyers credit for capital goods, then what are the repayment ways available to importer. Half yearly, yearly ,monthly? How repayment should be made? Buyers Credit can be taken for partial amount of Invoice. Buyers Credit can get taken against all payment mode except Advance payment. Thus as per below example, importer will be able to take buyers credit for collection bill if he has required limits and for tenure will be limited to his operating cycle. The importers have imported Capital goods from overseas buyer . The Sight bills were presented in Bank under LC. The importers requested for buyer’s credit. However before arranging quote, the payment of said bills was made under Lc by forced debit to CC account of importer. Now since the payment has already been made, whether bank can still arrange buyer’s credit to the credit of CC account of importer. The payment has been made 7 days before only. Once import bill is paid, buyers credit cannot be taken against that transaction. In many cases our bank is charging 3-4 days extra interest in case of buyers credit. They say if we require fund on say 5 th of the month then they have to arrange it on say 1st/2nd form overseas bank against LOU. so is it correct practice as we have to pay interest for higher period. Incase of buyers credit it is advisable to take fund from overseas bank 1 day in advance of the due date. As international market work from Monday to Friday, in case were due date is on Monday, banks will have to take fund on Friday. The same also become true because of funding location holiday or US Dollar holiday. Thus one needs to look at case to case basis. In case of direct import case can we do buyer’s credit wherein client has provided commercial invoice and bill of lading.Bill of entry not submitted by client and reason given by client that goods are still in transit. Yes, buyers credit can be done for import under direct documents without bill of entry copy based on undertaking from import to provide copy of bill of entry within 90 days from the date of remittance. What are the charges to be paid to the bank for issue of LoU ? Is there any circular mentioning 15 CA CB is compulsory if quote is taken from foreign bank. No there is no such circular. It is based on interpretation of existing sections and circular of Income Tax Act. overseas bank credit the nostro account of applicant’s bank on the basis of letter of comfort or letter of undertaking.Right? So I want to ask you whether applicant;s bank issue such letter of comfort directly to overseas bank or handed over to applicant? Direct message to overseas bank through SWIFT with its acknowledgement can be considered as letter of comfort? 1. Both. Depends on what instrument is used. Incase of Overseas Branches LoC is used and incase of other bank branches, LOU is used. What would be the all-in cost of buyers credit including hedging? What are the options available for a 3year exposure? 1. Overall costing for buyers credit will be about 9% including hedging cost. 2. Incase of capital import it is suggested that buyers credit is taken for 1 year and rollover the same every year. Hello Sir. Your updates on Buyers Credit and Allied Funding is highly soughted. Sir, Could you please advise us as to weather we have to Submit ECB-2 (Form by RBI) in case a corporate avails buyers Credit either from Foreign Branch of Indian bank Or a Foreign bank. In our Case the Buyers Credit is availed for 3 Years. What is suppliers credit? And also it’s benefit. Is Subsidy of Tufs available to unit taking buyers credit for import of machinery. Tufs subsidy is available based on disbursal of term loan. For the tenure till buyers credit is taken Tufs benefit is not available. Once it is converted to Term Loan after 3 years, for rest of the tenure Tufs benefit is available for balance 4 years. i have licence to import dore gold bars, can i avail buyers credit facility to import the same, if yes then what is the usuance period for the same .we procure gold dore bars to refine them and manufacture jewellery out of it. sir, is hedging necessary to avail buyers credit? RBI Circular on Trade Credit does not specify anything on hedging. But other circulars on hedging has left the option of Hedging on Banks Board of Directors determined policy. Thus if policy of bank is that for all buyers credit transaction hedging is mandatory then one will have to do hedging. What in case of Repaymemt early ?? I mean if due date is after one month and want to pay today, is it possible?? Sir how is maturity date calulated in lc from the date of acceptance or from the date of bill of lading and what are the rbi rules for it. As per RBI, maximum tenure allowable is as per operating cycle and it should be from date of Shipment. Q2) We had procured raw material from overseas buyers for Credit period (Without opening LC) on plain credit basis. Whether we can avail buyers Credit for balance duration (i.e 180 days – Shipment Date). 1. Buyers Credit can taken only if limits is available. In the above case if limit is not available. Then further buyers credit cannot be taken. Need to know Buyers Credit procedure, like Bank is just providing us quote on mail, we are confirming the same and based on confirmation within 2-3 days Bank makes payment and provides us with Swift copy. There is no other documentation. Apart from it Bank has charged us Rs 3.5 Lacs Buyer’s Credit account opening charges, there is no account statement or online access of such account to us. Bank is keeping/blocking 25% cash margin from our CC account at every buyer’s credit payment.please help and let me know if such is the right procedure or should i ask Bank to give further details of interest bank charges, or any documents as proof of every payment.